PRINCETON, N.J. -- An average 43% of Americans identified politically as independents in 2014, establishing a new high in Gallup telephone poll trends back to 1988. In terms of national identification with the two major parties, Democrats continued to hold a modest edge over Republicans, 30% to 26%. Since 2008, the percentage of political independents -- those who identify as such before their leanings to the two major parties are taken into account -- has steadily climbed from 35% to the current 43%, exceeding 40% each of the last four years. Prior to 2011, the high in independent identification was 39% in 1995 and 1999. The recent rise in political independence has come at the expense of both parties, but more among Democrats than among Republicans. Over the last six years, Democratic identification has fallen from 36% -- the highest in the last 25 years -- to 30%. Meanwhile, Republican identification is down from 28% in 2008 to 26% last year. The latest results are based on aggregated data from 15 separate Gallup telephone polls conducted throughout 2014. These changes have left both parties at or near low points in the percentage who identify themselves as core supporters of the party. Although the party identification data compiled in telephone polls since 1988 are not directly comparable to the in-person polling Gallup collected before then, the percentages identifying as Democrats prior to 1988 were so high that it is safe to say the average 30% identifying as Democrats last year is the lowest since at least the 1950s. Republican identification, at 26%, is a shade higher than the 25% in 2013. Not since 1983, the year before Ronald Reagan's landslide re-election victory, have fewer Americans identified as Republicans. The decline in identification with both parties in recent years comes as dissatisfaction with government has emerged as one of the most important problems facing the country, according to Americans. This is likely due to the partisan gridlock that has come from divided party control of the federal government. Trust in the government to handle problems more generally is the lowest Gallup has measured to date, and Americans' favorable ratings of both parties are at or near historical lows. Thus, the rise in U.S. political independence likely flows from the high level of frustration with the government and the political parties that control it. Although independents claim no outright allegiance to either major party, it is well-known that they are not necessarily neutral when it comes to politics. 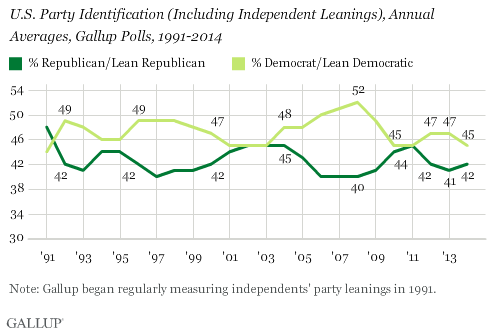 When pressed, most independents will say they lean to one of the two major parties. 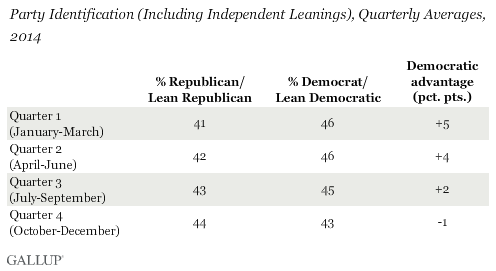 For example, last year an average of 17% of Americans who initially identified as independents subsequently said they "leaned" Republican, 15% were independents who leaned Democratic, with the remaining 11% not expressing a leaning to either party. Since partisan leaners often share similar attitudes to those who identify with a party outright, the relative proportions of identifiers plus leaners gives a sense of the relative electoral strength of the two political parties, since voting decisions almost always come down to a choice of the two major-party candidates. In 2014, an average 45% of Americans identified as Democrats or said they were Democratic-leaning independents, while 42% identified as Republicans or were Republican-leaning independents. That the three-point Democratic edge was down from six points in 2013, and among Democrats' smaller advantages the past 25 years. Democrats usually hold an advantage in this combined measure of party affiliation. In fact, the only year Republicans held a notable edge since Gallup began tracking independents' political leanings was in 1991, the year Republican President George H.W. Bush's approval ratings soared after the United States' victory in the Persian Gulf War. Democrats' high point came in 2008, in the final year of George W. Bush's administration and the year Barack Obama was first elected president. However, the three-point Democratic advantage for all of 2014 obscures the change that occurred during the year. On a quarterly basis, Democrats started out 2014 with a five-point edge, similar to their advantage in 2013. That dipped to two points by the third quarter. In the fourth quarter, likely in response to Republicans' success in the 2014 midterm elections, Republicans held a slight advantage of one point. Since 2008, Americans have been increasingly reluctant to identify with either the Republican or Democratic Party, and now a record 43% claimed political independence in 2014. Given historical trends, 2015 could bring a new record, as the percentage identifying as independents typically increases in the year before a presidential election, averaging a 2.5-point increase in the last six such years. Although Democrats typically have an advantage in partisanship, that edge shrunk in 2014 and in the last months of the year the parties were essentially on equal footing. With each party controlling part of the federal government -- Democrats the presidency and Republicans the Congress -- they each will have a say in how the nation addresses its major challenges in the coming year. However, in recent years divided control of government has more often than not resulted in partisan gridlock, and Americans' frustration with the frequent political stalemate is evident. Continued frustration with the government would likely encourage more Americans to identify as independents this year. Results for this Gallup poll are based on telephone interviews conducted January-December 2014, with a combined random sample of 16,479 adults, aged 18 and older, living in all 50 U.S. states and the District of Columbia. For results based on the total sample of national adults, the margin of sampling error is ±1 percentage point at the 95% confidence level. All reported margins of sampling error include computed design effects for weighting. Gallup's key voter turnout indicators reveal that Americans are far less interested in the election this year than in 2010, and less likely to say they'll vote. 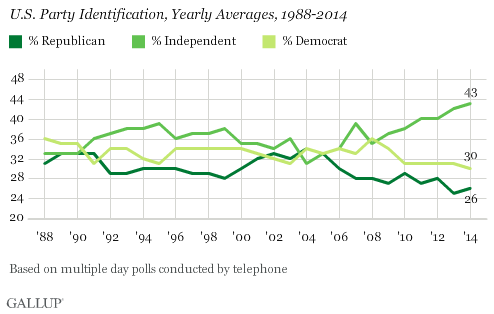 Voter engagement has dropped significantly among independents. Obama's "Strong Disapproval" Double His "Strong Approval"
Americans are more than twice as likely to "strongly disapprove" (39%) of President Obama's job performance as they are to "strongly approve" (17%). The margin in approval ratings of his performance has steadily grown since 2009. President Obama's approval rating is below 40% in three of six states with competitive Senate races. While party preferences have been stable in most of these states, the GOP has seen significant gains in Arkansas.